« Weekend Reading: Big Polluter? Bad Petroleum? Beyond Patience? It has been a few months since we last checked in with the Coppock curve. If you’re not familiar with this indicator (also referred to as the Coppock Guide), check out the previous link for background information. If you recall, back when we were still in the thick of the recent bear market, many saw the rally off the March 2009 lows as nothing more than rigor mortis. Sentiment was so bearish, that even when the Coppock curve finally gave its blessing - rather late as its nature dictates - many still questioned the possibility of a bull market and cast aspersions on this noble indicator. At the beginning of May 2009 I mentioned that the Coppock guide was about to give a bullish signal. Since then the S&P 500 index has climbed more than 200 points or 25%. Below is a chart of the Coppock indicator since 1940. The signal occurred when it went from -417 to -409, an increase of 8 points. This was also an incredibly negative level that it had not seen in modern history. From those depths, the Coppock indicator has increased 1139 points (from -417 to the current +305) in just 14 months. That is the largest absolute move since 1940 - no doubt partly due to the extreme oversold condition from which it started. As an oscillator, we now find it very close to the other extreme end of the spectrum. While the Coppock curve is not traditionally used to find market tops, extremely high levels such as those above +300 or +400, usually correspond with either market tops or plateaus in stock market prices. This month was the weakest showing for the month of May since 1940 with most indexes down 8%. If the S&P 500 index closes at the end of June below 1095, then the Coppock curve will have curled down for the first time since November 2007. Otherwise, it will continue to climb. This scenario dovetails with the recent commentary from Lowry Research about moving away from a primary buying phase where one is allowed more leeway to be an almost indiscriminate buyer to a more selective stage as the bull market matures. 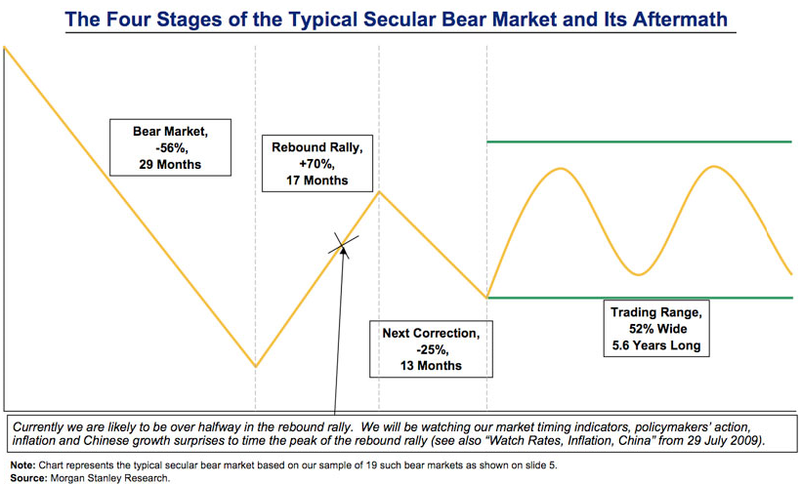 As well, it agrees with the comprehensive study of the Aftermath of Secular Bear Markets. That study suggest we are about to enter a more low return environment where the market chops in a sideways trading range. There will still be plenty of opportunity to make money. We just are not in the same high momentum environment we were in before. I think that about sums up the implication of the current Coppock guide. The low risk “middle” of the trend has been served. It isn’t necessarily the last we’ve seen from this cyclical bull but what remains will be messier and come with higher risk than what we’ve seen this past year. but i am still bearish on current conditions i think market will be totally volatile and it is better to buy at dips.I really liked what Mr. Potter said his policy is really clear and persons following the same policy can get money in more easier way. On May 26th, reader Joe was asking for a follow up on the “Calling all Contrarian Investors!” blog post. Joe’s quote: “Can we have a follow up on this pattern in a few days? I noticed this pattern as well, but couldn’t convince myself to trade it”. Well, you’ve been right to be skeptical: The S&P 500 is still unable to clear the congestion at ~1080. It is not wise to just look at short term oversold indicators. One needs to consider the investing environment as well. Rod, the S&P 500 is still mired in the (support) congestion area - until that resolves itself, there is not much inference we can make. Every market moment has different circumstances. The numerous variables in effect on our world markets now, both bear and bull, did not exist at previous market moments. How then can one extrapolate today based on past performances where different variables existed? For instance, was there a second reserve currency (today the Euro), and was it getting beaten down? Was there an emerging economic giant in the developing East (today being China) whose fortunes influenced stocks so heavily in the US? My comments are not critical but aimed at debate. Perhaps I am wrong. Babak is correct in his read of the Coppock Curve. I update my tracking spreadsheet regularly and came to the same conclusions. Andy, while circumstances today are unique to any in the past, human emotions and reactions to them tend to remain consistent. The Coppock Curve is a long-term momentum indicator and identifies when bullish sentiment seems to be waning and bearish sentiment takes over. These changes occur over long periods of time, not days or weeks. The odds are that sentiment, after the long period of bullishness since March is tired and needs to take a rest. I agree with your thought process. There are always more variables than we can comprehend. We always pick the variables we know and calibrate our output. Technical analysis tries to work with price and volume instead of understanding many other variables. But, fundamental analysis is more challenging and lot of educated guess work is needed. Regarding statistics, I have lot more fundamental questions. We need at least 30 data points to form reasonable conclusions. In many cases (secular bear markets and such), we don’t have that many data points. So, our analysis is completely biased and inaccurate. The more we think on those lines, the difficult investing becomes. Investing at 7 to 10 times normalized peak earnings should work well. But, this game is more about patience. Waiting for 7 to 10 times earnings can be multi decade wait. Since 80’s, stocks have clocked in the 15 to 45 range and painfully justified as fair value.